If you don't have time to make homemade ice cream or don't have an ice cream maker, just add your favorite store bought ice cream to finish off your meal. An easy, tasty way to get the nutritional benefits of salmon. It's also an excellent use for left-over cooked salmon, although canned salmon works as well. 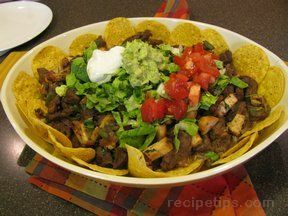 This Mexican favorite is full of all the flavors you love in nachos with a little extra due to the fajita seasoning. Make any changes to the toppings to please your family. Tender lamb chops, grilled with a bit of olive oil, lemon juice, and fresh rosemary, are accentuated with a delicious aioli sauce. Try this easy-to-prepare lamb recipe as a terrific Easter dinner alternative to traditional roast leg of lamb.